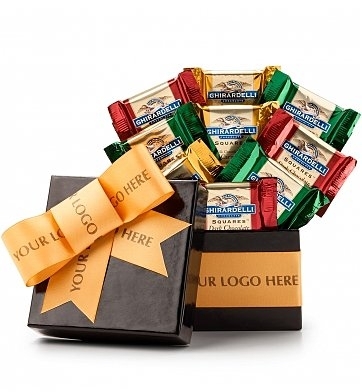 Ghirardelli gift box in a variety of stylish colors opens to reveal an abundance of decadent assorted Ghirardelli Chocolate Squares in mouthwatering flavors like Caramel, White Mint, & Dark Chocolate. A popular gift giving solution for giving to large groups of clients or customers, and always makes an elegant impression with its beautiful presentation. Choose from a variety of classic box colors to customize your gift and please contact us today for more information: we'd love to help you make a great impression! Gift Box Measures 5" x 5" x 3".